The cottage is over 200 years old and for a period functioned as a village school, despite its small size. Situated on a quiet street, there are good views of the countryside. 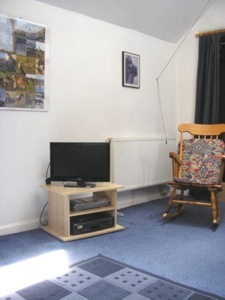 The ground floor has a well-equipped kitchen, with a twin-oven electric cooker with ceramic hob, and a microwave. 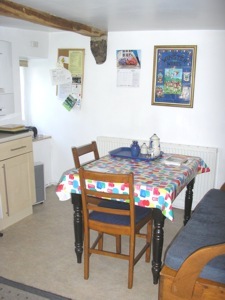 Adjoining the kitchen is the dining area, which seats four. Also on the ground floor is the bathroom. There is a full-sized bath with shower over, washbasin and WC. Upstairs, the ceiling has been removed to give a high, bright, living room with windows in the roof and walls. At one end, a sleeping loft is reached by a ladder. Alternatively there is a double sofa-bed. There is gas central heating throughout. 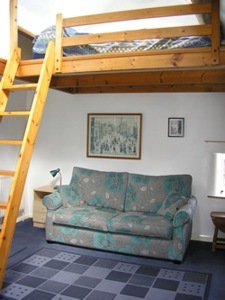 The rental price includes linen and towels, gas, electricity and free wifi access. 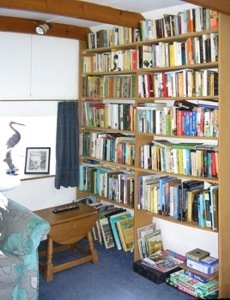 There is a TV and DVD player, a stereo FM tuner/tape deck/CD player - and a large collection of books. Off-street parking is provided at the rear of The Old Manse, about 50 yards away up a rather steep path with some steps. 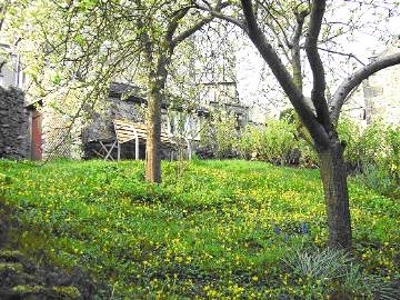 The cottage itself is on a steep hill leading up from the Main Street and it is unlikely to prove suitable for anyone with mobility difficulties. 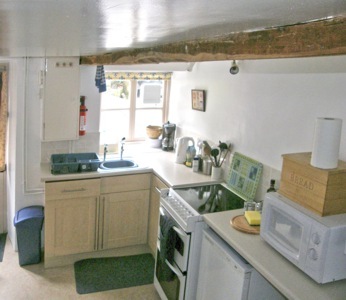 The cottage is detached, and has a small private garden with lawn and fruit trees. A bench gives views across to Birchover Edge - perfect for a drink as the sun goes down. One well-behaved dog is welcome at £15 per week. Bike storage is available.